Do (Normal) Jews Believe in Prophecy? I've just visited ProphetsOnline.hvn and linked from there to hundreds of other prophecy sites on the web. I have to tell you, it's pretty bizarre. Is this a Jewish thing? Do we believe that we can understand and predict all the events of today from the Bible? Is it true that the Lubavitcher Rebbe tinkered in this? Children of the Mcluhanesque world, overdosed on TV hard sell and duly vaccinated against religious doomsayers, we've grown up with healthy red flags that trip at the mention of the word "prophecy". We've had Nostradamus up to our noses, Bible Codes out of our ears and anything else the National Enquirer deems fit to grind pulp over ad nausea. The purveyors are dubious, the content is wacky, ambiguous, vague, and useless, too — who needs a prophet if he's only understood in retrospect? On the other hand, I don't doubt there is such a phenomena as the Supreme Cosmic Consciousness expressing itself within the minds of mortal beings. Who doesn't get a flash of inspiration once in a while, with no clue where on earth it came from? And if it didn't come from somewhere on earth, where did it come from? And if a little inspiration can come from somewhere other than earth, why not the very words themselves, along with the whole vision in hi-definition, panorama color? In fact, real prophecy — nevu'a, in the Hebrew — is what makes Torah and Judaism possible. Rabbi Judah Halevi (circa 1105) in his classic presentation, The Kuzari, places nevu'a as the distinctive mark between Torah and philosophy. Maimonides counts the belief "that G‑d causes human beings to prophesize" as one of the thirteen principles of the faith. And in a letter to the Jews of Yemen, he wrote that shortly before the messianic era the spirit of prophecy will return to the Jewish people. The Talmud recounts that the Age of the Prophets came to a close in the first generation of the Second Temple Era. Yet there were always enlightened men and women — "tzaddikim" — who attained Divine Inspiration and provided their people with guidance. It makes sense: A person who is 100% saturated with nothing but fulfilling the Divine will and connecting with the Infinite Light will intuitively know and understand the deeper workings of the divine plan for creation. And if you know the perils of Jewish history you'll understand that Jewish people often needed some supernatural guidance real bad. It's just that, like anything else, I need hard evidence. Before I will be convinced that so-and-so knows things that the rest of us don't and risk my life based on his/her predictions, you'll have to provide me with some pretty good reasons to believe so. You wouldn't see a doctor unless he's passed some criteria, so what's different about an oracle? How about if your family physician's diagnoses ran something like, "The fountain of life swells to erupt in ever abundant effulgence"? You wouldn't know if you were pregnant or just had acne. So what separates the prophets from the profiteers — and the loony bin? The Torah's requirements for a real prophet are rigorous enough: Prophets must provide meaningful, useful information. They are not believed until they have demonstrated their accuracy, or have been approved by another prophet who passed such a test. Their predictions cannot conflict with past prophecies, certainly not with the prophecy of Moses. If they cross any of these lines — and claim to be Divinely informed — they are culpable with their very lives. What if this seer-wannabe does miracles and performs wonders? Sorry, he'll have to find another nation to accept him. We're not impressed by miracles and wonders — could be slight-of-hand, could be black magic, could be hi-tech multimedia. And what's it got to do with prophecy, anyway? We need real proof. If you're still interested in trying out, see Maimonides, Mishnah Torah, Laws of Prophecy for all the fine print. What about if someone says, "I'm not a prophet, I just had a state of clarity in which the hidden things of the universe became clear as day"? If s/he leads a humble and virtuous life a few steps beyond the rest of us with no pretensions to fame and glory, then give this person a chance. Otherwise, just ignore. I'm not a chassid of the Lubavitcher Rebbe because of his predictions. There are far more compelling factors, such as his concern for every human being, the fathomless depth of his insights and his interminable spunky attitude towards the entire world. Miracles may be flashy and fortune telling may be neat, but neither do a rebbe make. September 22, 1980; Iraq attacked Iran. Most of us didn't see that as something earth shaking — but one person did. The Lubavitcher Rebbe began to talk repeatedly about how "the earth is shaking…nations are inciting one other, threatening the very stability of the world…". Eventually, he asked us to add prayers for the stability of the world and accept upon ourselves every morning the mitzvah to love one another. I remember being quite puzzled at the time: The earth under my feet seemed quite firm. Is there any more instability now than during, say, the Cuban missile crisis? As the Iraq-Iran conflict drew on, the Rebbe sent a message to Benjamin Netanyahu, then Israeli ambassador to the UN. He warned him not to consider this a regional conflict — the fact that Iraq is not afraid to attack a country much larger and more powerful than itself is a sign that soon it will be ready to make war with the entire world. Ten years later, June, 1990. The Rebbe declares the coming year as a year in which we will see wondrous miracles. He asks that this be printed on the calendars for next year. At every opportunity, the Rebbe repeats his promise. August 2, 1990. Iraq walks into Kuwait. The U.S. and it's NATO allies rush troops to Saudi Arabia to deter a possible attack. Egypt and several other Arab nations join the "Operation Desert Shield." Hussein meanwhile builds up his occupying army in Kuwait to about 300,000 troops — and announces that, if attacked, he will immediately turn his air force and guns toward Israel. Things aren't looking too miraculous yet. The king of Persia will attack an Arab nation. The Arab king will go to Aram for advice. The king of Persia will bring destruction to the entire world, and all of the nations will be struck by panic and fear ... Israel will also be overtaken by panic and fear, and they will cry, 'Where shall we go? Where shall we go'? Moshiach will then tell them: 'My children, fear not. Everything I have done, I have done for you. Why are you afraid? Do not fear! The time of your redemption has arrived." At the times of the Midrash, the Persian empire was centered in Mesopotamia — modern-day Iraq. The Arab nation can then be understood as Kuwait — being on the Arabian peninsula. As for Aram, this means a superpower (ram means "exalted"), namely the United States of America, to whom Kuwait turned for assistance. In summary, the Rebbe's message was: There is nothing to fear. All that is happening is in order to prepare the world for the messianic era. "There is nothing to worry about. They only need to increase their confidence in G‑d and then He will increase even more His blessings — with serenity for the soul and body." For whatever reasons, people take military experts more seriously than a Chassidic rabbi in Brooklyn. Israel was scared. They knew the kind of bio-chemical weapons Iraq had designed just for them. Weapons that could render the land uninhabitable for centuries. The feeble solution: Distribute gas masks to the populace. Israeli radio interviewed Rabbi L. Groner, one of the Rebbe's secretaries, and asked for the Rebbe's opinion concerning gas masks. The response: The Rebbe feels there is no need to scare people. Concerning gas masks: Every Jewish child who has learned Torah knows the verse, "The eyes of the Lord your G‑d are upon the land from the beginning of the year to the end" (Deuteronomy) Ask any child what that means. There is no need to scare people. Concerning hoarding food: This is forbidden by halachah (Jewish law), as it drives up the price of essential needs. Hold on now: The Rebbe is dealing with human lives — lots of lives. This is not some confident talk over the dinner table. He's taking a major responsibility on his shoulders. "When I left for New York, the panic was at its height. Everyone was anxious, worried and shivering. I told the Rebbe and he answered assertively, 'There is no room for worry. There will not be any strike against the Israeli People.' I listened in astonishment. How could this be? It's impossible! We are distributing gas masks to the entire populace… according to reliable intelligence sources..."
Over the following months, the Rebbe didn't let up. He repeated the words of the Midrash at every occasion, "My children, do not be afraid! All that I have done has been for your sake. The time of your redemption has arrived." Back in Israel, the line-ups at the airport were growing. Airplanes left full and returned empty. Universities and yeshivas were becoming desolate of their foreign students. But the Rebbe not only discouraged leaving, he encouraged people to travel there, saying that now is the best time to visit Israel, to encourage Israel's residents. Even people who had plans to leave Israel to attend a wedding were discouraged. "I publicize at every opportunity that it is necessary to travel there. On the contrary, this is the safest place, since it is the place of the Temple Mount and the place of the Temple. The main factor is that there are millions of Jews there, may they be increased." "G‑d forbid! What kind of thinking is this? It shouldn't even be spoken — even just the idea of leaving Jerusalem!" "You must publicize the fact that you are traveling to Israel, because there are Jews who are afraid and are frightening others traveling there. It should be publicized that you are traveling and that there is actually nothing to worry about. It is the safest place, because it is the place of the Holy Temple." Each Israeli general and military expert presented his scenario to the media. All had one assumption in common: Israel would be dragged into this war and hit hard by it. The only questions were when and how hard. Many Israeli reserve soldiers abroad understood that it was time to return to Israel to take part in a defensive operation. The Rebbe answered clearly, whenever asked, that there was no need for them to do so. The papers displayed pictures of religious public figures that had removed their beards in order to fit on their gas masks. The Rebbe told both civilians and militia that there was no need to remove the beard. The Israeli media quoted a dean of a certain rabbinical college describing the "holocaust" that was about to occur. We never heard the Rebbe so vehement as in his reaction to that statement. On the one hand, the Rebbe's unbearable pain and horror at hearing such a statement. On the other hand, the confidence and certitude that "G‑d loves His people, sees only the good in them and has only good in store for them — miracles and wonders." The Rebbe was privy to inside intelligence unavailable to the CIA or the Mossad. The Rebbe was collaborating with aliens working for the stability of the planet and had worked out a deal by which they would use their invisible technology to intercept missiles and aircraft traveling toward the Holy Land. There is a phenomenon, the mechanics of which have yet to be described by any science, by which certain individuals may be acutely aware of the progress of the cosmos. A.k.a. "Prophecy" or even plain "Divinen Inspiration". January 16-17, 1991: The Coalition air war begins. Bombers and cruise missiles strike at power plants, munitions factories, and other strategic targets. January 17, 1991, 3am: Iraq keeps good on its promise and fires seven scud missiles at Israel. Now, I have to admit, I personally was very confused at this point. I'm sure I was not alone. Many of us — most likely, George Bush Sr. included — were betting on the odds that Saddam wasn't really as crazed as he seemed and would back down at the last moment. I mean, here you have the entire world's army at your doorstep without an ally to speak of aside from Yasser Arafat — could there really be a megalomaniac of this size? So, I thought, that must be what the Rebbe is predicting — Israel will be safe because there will be no war. And now there was war, scuds and all. I recall listening to a sensationalist BBC reporter reporting, "I see explosions and fire over Jerusalem!" A neighbor dryly asked, "So what does your Rebbe say now?" "Obviously, these events will not hurt the Jewish People in any way… especially those living in Israel… it is the safest place on earth. As far as the deeds of those who hate us and are attempting to hurt us, G‑d forbid — there is no substance to their attacks, they will not succeed, since 'the Guardian of Israel neither sleeps nor slumbers.'" The Rebbe also wished a complete and full recovery for those who were injured in the attacks. "I instruct everyone to travel to Israel. It is obvious that those who are already there must not leave. And those who are able to travel there and have already let others know — if they do not go it will be understood as a contravention of the Code of Jewish Law [not to strike fear into the hearts of your brothers —ed.]." Scuds kept falling. Mainly in the Tel Aviv area. Daniel Pe'er had planned a large wedding celebration in a Tel Aviv neighborhood. Now, with missiles knocking down buildings, he was thinking maybe that's not a good idea. The Rebbe disagreed and the wedding was reported in the papers. What is a scud? A liquid fueled, long-range 20-foot long missile that can be armed with either a 100 kiloton nuclear warhead or 1,802 pounds of conventional explosive. Scuds can also be used to deliver chemical or biological weapons. When Iraq fired scuds at Iranian civilian targets, hundreds of thousands were killed. For whatever reason, none of the scuds that landed in Israel had nuclear, chemical or biological warheads. Some landed in empty fields. Some in the ocean. One hit a highly strategic point, obviously aimed to cause extreme devastation: A natural gas pipeline node between Haifa and Tel Aviv. But that happened to have been shut for repairs two days earlier. Another landed in an empty lot right across from a crowded shopping mall. A few demolished entire buildings. But nobody was killed by any of them. Yes, there were those who died of heart attack triggered by fear and anxiety. Seven died from improper use of a gas mask. Even the secular press was full of news of "miracles and wonders." "The building had five floors. We were all on the bottom floor, since there was an alert. The entire building shook, we were thrown from our places. And then we looked up. The scud had pierced the fifth, the fourth, the third and the second floor — and it's warhead was peeping at us through the ceiling. That is where it stopped. There were some minor injuries." A Persian taxi driver told me how they had asked their mufti, "How is it possible that the same missiles that wreaked havoc in our country are so impotent when they strike Israel?" The mufti replied, "Because that is the Holy Land." Okay, it's your turn: Find a precedent in military history, in which lethal weapons struck highly populated areas without causing mortal casualties. Theory number four: Undercover Lubavitchers, posing as Iraqi military technologists, secretly placed mutant super-intelligent kamikaze pilot guinea pigs aboard each scud. These then subtly maneuvered the missile's path at the last moment according to precise instructions to provide the illusory effect of a miracle. The Coalition air attack, "Operation Desert Storm", met minimal resistance. But military pundits unanimously forecast a long and bloody ground campaign on the perilous Kuwaiti-Iraqi terrain. Nobody doubted that Saddam's arsenal of bio-chemical weapons would be unleashed on the approaching armies. Conservative estimates predicted a battle of several months costing tens of thousands of lives from the Coalition Forces. In the first two days of the ground assault, the Coalition forces took more than 30,000 Iraqi prisoners. The next two days featured the largest tank battle since World War II in which hundreds of Coalition tanks, armored infantry vehicles, and combat helicopters destroyed 200 Iraqi tanks. No Coalition losses were reported. Total Coalition losses reported for the entire Gulf War: 300. The Rebbe was later to say that those who witnessed these events saw open miracles. Ask a marine who was there and he'll tell you the same thing. One hundred hours after "Operation Desert Saber" began, Saddam agreed to a ceasefire. On the Jewish calendar, that day was Purim. It was a wild Purim. "I was standing next to the Rebbe at the time. Goldstein told the Rebbe he was being sent to the Gulf and was taking along a megillah for Purim. The Rebbe looked surprised and asked, "What do you need a megillah for?" Confused, Goldstein mumbled something about the fact that there are Jews there who need to hear the reading of the Book of Esther on Purim. The Rebbe told him, "By Purim you will be in a place where there will be plenty of megillahs and you certainly won't need one." It seems many who heard about this verbal interchange made the implication that the war would be over by Purim. As it turned out, a week before the war was ended, the Americans sent some officers to man the Patriot Missile Interceptors in Israel. Some were Jewish, so Goldstein was sent along. So when Purim came, he was in Israel. It's not in keeping with the Rebbe's character to flaunt explicit forecasts. The Rebbe's style is to hide any accomplishments that may seem supernatural, attributing his pronouncements to common sense and basic Torah law, purposely avoiding the flash and sparkle that generally goes along with miracle-making. After all, what was the Rebbe's agenda with these predictions? To sell lots of books? To get on the Oprah Winfrey Show? The Rebbe simply wanted people to increase their confidence in the One Above, lower their blood pressure and stop the gloom and doom by seeing all that is happening as a precursor of the imminent messianic era. If that deemed a few awesome miracles necessary, so be it. A dab of prophetic vision? Whatever. Which brings us to the finale: How does any of this help us sleep better at night — tonight? Or move ahead in life — today? Well, you see, tzaddikim can sometimes say mysterious things. It's as though they were describing the landscape from a satellite rather than from the ground, except with time rather than space. They might talk about things far away as though they were happening right now. And so it was, on the Shabbat immediately after Purim and the ceasefire that the Rebbe addressed his Chassidim, speaking about the miracles and wonders and their meaning. And then he wished success to the American forces in their mission in Basra. "Who is this coming from Edom, with soiled garments from Basra? This one who is majestic in his clothing, girded with his abundant strength?" The Rebbe was encouraging the American troops to finish off the job. But when it came to publishing that talk, he told the transcribers to hold off. "The time for this has not yet come," he informed them. And now, five weeks later and two days after the ceasefire, the Rebbe was speaking as though his advice had been followed and a finish-it-off campaign had already begun. Twelve years later to that day on the Hebrew calendar, American troops attacked Basra — to finish off the job they had begun. President Bush Jr. addressed the citizens of Iraq on that day and said, "The day of your liberation is near." "It is I, who speaks with righteousness, abundantly able to save!" "Why is there red on your clothing and your garments are like those of someone treading in a wine vat?" "I have trodden a winepress alone, not a man from the nations was with me. I trod on them in my anger and trampled them in my wrath and their lifeblood spurted on my garments so I soiled all my garments. For a day of reckoning is in my heart and the year of my liberation has come. I looked, but there was no helper. I was astounded that there was no supporter. So my own arm saved me and my own wrath supported me." When I heard the news of how dirty this war had become, with human shields of women and children, torture of POWs and the threat of bio-chemical warfare in urban Baghdad, the images would not let me rest. But then I recalled the Rebbe's assurance, citing that ancient Midrash, "My child, why do you fear? All that I have done has been for your sake. The time of your redemption has arrived." A tzaddik sees a little further. Twelve years have passed — the vision is approaching its resolution. Yes, war is ugly, people are suffering. But the Rebbe’s vision is not one of apocalyptic doom. It is a story of liberation from modern-day Pharaohs, of determination and serenity in the face of malevolence and hatred, of a maturing of humankind as we clear the highways for an era of wisdom and peace. The Zohar describes the tzaddik as one, "who turns bitterness to sweet, darkness to light." The Rebbe reconstructed our interpretations of the darkest visions of the ancient prophets into a sweeter version, stirring in compassion with faith, kindness with hope. And as the Talmud tells us, "A tzaddik decrees, and the Holy One, blessed be He, fulfills." I sleep knowing that though this war is ugly and horrible, it is the rumblings that precede the time when G‑dly wisdom will cover the earth. May that time be closer than we can imagine. How Do We Know that G‑d Exists? Is There a Logical Proof that there's only One G-d? How Do I Deal With Doubt? Can We Speak Intelligibly About G-d? Can One Love an Unknowable G‑d? You give short shrift to the "Bible Codes" in your opening paragraph, yet the existence of a bible code was publicized originally by Jews, including the "Aish Hatorah" and touted as a proof of the divine origin of the Bible. Eventually, Christians got on board and discovered codes and correct prophesies of future events in their "New Testament," as well. Critics of the Bible codes showed that you could find such codes in books such as "War and Peace," too. I guess that's about the time we stopped hearing about the codes. as we clear the highways... The Rebbe exerted such an effort to bring more Jews to the Holy Land and to keep there those who were there at that crucial moment... He was trying to bring the Redemption... Like Baal Shem Tov or other tzaddikim who tried to reach the Holy Land in order to bring Redemption in their time... Something went amiss again. Yashar koach Tzvi Recalling the events of those days which you so beautifully and faithfully recounted never fails to bring tears to my eyes, a deep sense of pride in being connected with the Rebbe in a small way and love both for the Rebbe, and following his example, for all the Jewish people. To use a legal expression, "Res Ipsa Loquitor", it speaks for itself. Do Jewish People Believe In Prophecy I found this so great and wonderful. I don't know what the word normal means but I do and would only follow a Jewish prophecy as the Bible speaks that all the world shall turn to the Jewish people for answers. Fear nothing but His Majesty A tzaddik lives the words of Torah and tries to share with others. I always refer to the miracle of the SCUDs and the miracle of the War of Independence when speaking to secular Israelis that have stubbornly given up on halachah because they don't want it "forced" on them. If their hubris would recede a bit and they would remember the miracles they saw, they would admit that Hashem protects them daily. Rather than fearing Iran's madman and the Three Weeks, I will pray harder for Moshiach to come. A trivial example The rebbe told a certain man, "Don't take that plane." The man obeyed. The plane crashed. People said, "Why didn't you warn the airport?" The rebbe said, "I was focusing on the man before me and what he needed to do. I did not know the plane would crash. I only knew he must not go on it, not why." The rebbe loved every person and every Jew and in return was much beloved. Who knows the number of prayers in his behalf. All that love and prayer could empower him to focus on the man before him and see HIS need and advise HIM. In the case of the SCUDS, he knew that people MUST NOT WORRY. Worry produced heart attacks and people died. The Rebbe saw this coming and tried to prevent it. He said people must not worry or fear, and this was precisely true. Worry and fear were the real danger. As to Purim, he knew that THAT MAN would not need to carry a megillah. He did nto know WHY and did not say why. HE KNEW WHAT HE KNEW. Prophesy when I was a spiritual, but not a "Bible believing", Jew(ess) I was wondering about the Jews. I knew the Bible said we'd be as numerous as the stars so I thought, "what gives?, where are all the Jews?" Thank you for reminding me what I fight for. I am in the army and some times wonder if we should be in the countries we are in. However G-d is in control and I thank you and your son for reminding me of that. Your article is incredible. So much ink has been consumed in attempt to describe the prophecies of the Rebbe but your article, in my opinion, captures the true essence of what a Rebbe is. 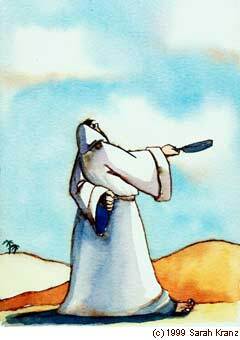 This is one of the best illustratrations I have seen depicting the Rebbe's prophetic visions, composed with intelligence & wit but with all seriousness and at the same time not narrowing the Rebbe's roll as "Rebbe" or shepherd of the Jewish People. In my opinion this article is a gem. Thanks to you that chassidus is being translated and conveyed in such a manner that touches the pulse of the people of today. Thank you Tzvi and thank you chabad.org.